Learning is a endless process which always keeps us ticking and in the process we do makes lots of mistakes and learn from them thereafter. Do you think we need to do something special to gaze them no we don't we all learn from ppl and other living creatures around us the only thing required is the undying hunger to learn. I'm sharing some of the lessons I learned from my pet. 1. Play the hand: Some of us are born into the lap of luxury; others are not. Some of us come Auto-programmed for joy, and some are less inclined toward it. Some of us are nurtured magnificently, and some are nearly ignored. Lucky was adopted when she was two. You might think she'd be sullen, unable to trust, or stuck with a bit of a chip on her canine shoulder. Not so. she was a happy little girl who seems to demonstrate that it's not what you've been given that counts-it's who you become and what you do with what you've got! 2. Be Your Self: When we adopted Lucky, we almost forgot to ask her name. The clerk rolled his eyes and said, "It's Softy, but we'd change it to Lucky, if I were you." We soon learned that this miniature white poodle was anything but Lucky. She's athletic, funny, social, and uninhibited. Possibly, she's not even a purebred poodle. The name Lucky suits her well and she sports a pony tail. No matter what others think you should be like, it's always best, to be your true self. 3. Master the basics , Eat, sleep, exercise, and connect: Lucky was never too busy to eat, too distracted to sleep, or too tired for a walk. Nor does she ever turn down an opportunity to connect. Her wagging-tail greetings, sloppy kisses, and ability to land smack in the middle of the nearest lap , escorting to the bed and sometime sleeping inside the quilt in winter are all powerful statements of just how basic the need to connect really is. And yet, in today's 24/7 world, it is often easy to forget that family and friends are actually nourishment, and a major contributor to a sense of well-being. 4. Explore : Ever curious, and smart as whip, Lucky always seems ready to explore new territory. she'll happily learn new "tricks," check out new critters, climb hills, or give new poses to get the attention. In life, the choice is ours: play it safe and embrace the status, or face the unknown and continue to grow. lucky would give thumps up to "Stretch." 5. Make each day great: Spontaneously, Lucky will tear through the house, barreling at a breakneck speed. Or she might unexpectedly drop her rubber football at my feet, signaling it's time for a game of fetch. When she comes in from a walk, she sits patiently, "asking" for her treat. Do what you love, ask for what you want, and seize opportunities as they appear. Don't wait for joy to come to you; instead, seek it out every day. P.S : It has been a long gap since I posted something over this very space , I missed it due to my engagement over a project out of town, which took most of my time , coming to hotel in evening in exhausted state ..sleep and music were two best pals to give company. Hope you all having a great time ..will be reading yours post shortly. Thanks for stopping by and leaving comments.I'm getting lazy this summer ..trying to get into rhythm. One Response to "Lessons Learnt"
the one that captured me the most was "Be Yourself". You will be surprised many out there are not. It is amazing what we can learn from our pets... Ours teaches us to relax and smile everyday and not to sleep to late!!! They like breakfast!!! Yeah ..if we look we can learn a lot ..more to be human ...that way.. I thoroughly enjoyed reading your post. Being yourself is the most hardest and the most easiest thing to do:) Keep writing! and yes being true to our self is always good in every walk of life. Hello Vivi,nice to see you on my blog,i hope all is fine with you...i love the song on your background...who is in the picture??? Thanks Kelvin , yup its very impt to be true to yourself ..w/o it rest is of no meaning .. I think we are all have it ..its just we didn't try much ..over it . Yup pets are so amazing. Nice to see you , Yeah all is well now ...I'm glad you liked the song. 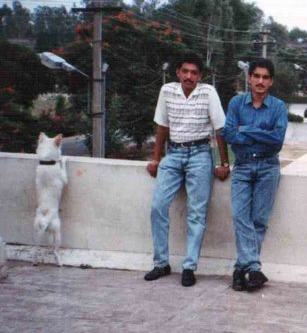 In the picture they are cousin brothers ( Ajay and Atul ) and our Pet dog Lucky. Don't worry ..much , you can user google a/c or Guest a/c with a option field enter your site address to link back to you. 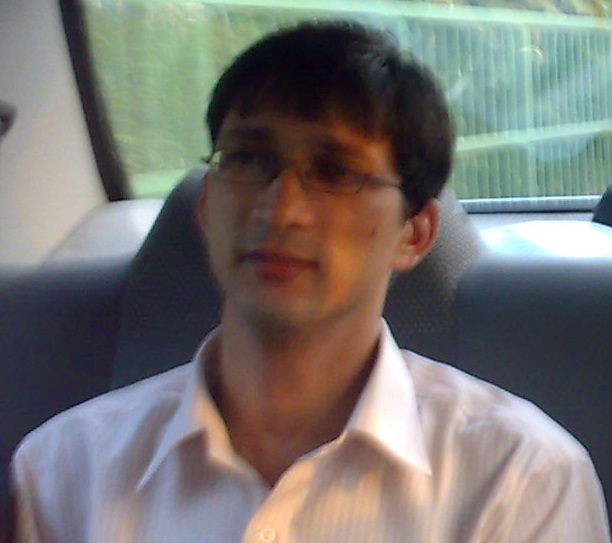 Hi Vivek after a long time. Lucky sounds truly amazing. Great tips you are giving here! I like the saying: "Make each day great"...you never know if there will be a tomorrow. Welcome back ...great tips. Its always a pleasure to read your posts. Wonderful post! Very good lessons learned and how sweet to find these lessons from your pet...dogs give such unconditional love to their owners! Thank you so much for stopping by and your kind comments! Hope you are relaxed after your trip away. Yup now its relaxation time weekends.